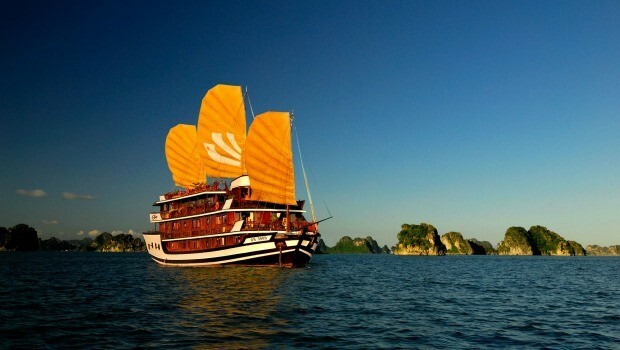 Home » Vietnam Travel » Ha Long Bay » 12 Best Halong Bay Restaurants – Where To Eat In Halong, Vietnam? Halong Bay, one of the Natural Wonders of the world, does not only has breathtaking landscapes that attract a large number of people worldwide every year, but also features a good wide selection of restaurants. Most of these Halong Bay restaurants feature delicious and fresh seafood dishes of Halong. Although these restaurants are a little bit pricey, they are really worth a visit as they provide high quality food dishes. 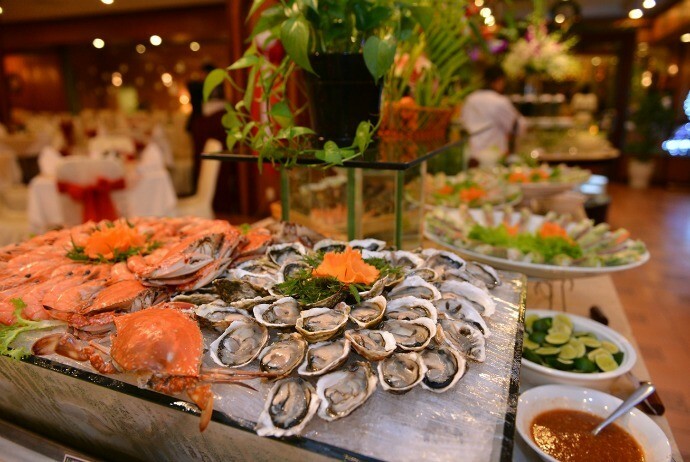 Halong Bay is very rich in seafood as it offers tons of shrimps, fish and oysters annually. The caught seafood served in most restaurants often comes right out of the fishing boats in early morning. A lot of best Halong Bay restaurants are the beachfront ones and situated in Bai Chay Town. Therefore, a romantic view for a tasty dinner is not a doubtful thing. If you stay in a certain hotel during your visit to Halong Bay, then you could begin your food adventure from the place you are staying. 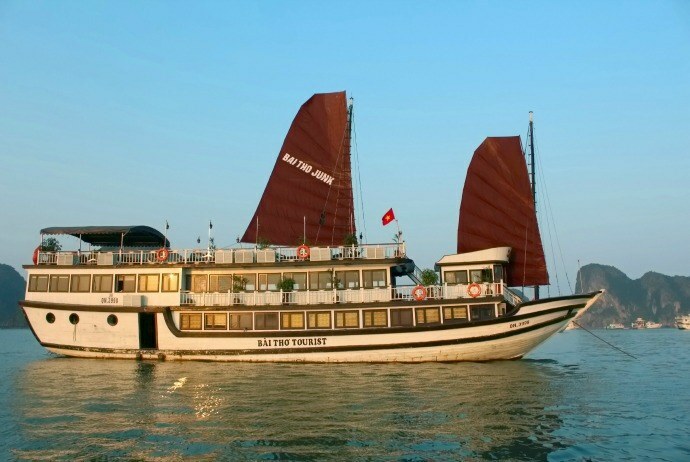 Or, you could check out some best Halong Bay restaurants below. While Chinese and Vietnamese foods are reckoned as major dishes in the coastal eateries’ menus, other Indian and western foods are recently getting more popular. Just take a quick look! Reckoned as one of the most beautiful Halong Bay restaurants, this restaurant has well-designed windows as well as terrace that provide guests with a panoramic view of the wonderful Halong Bay. In compared with other Halong Bay restaurants, the food quality here might be much better. With the capacity of about 250 customers, Panorama Restaurant has an extensive menu and unique architecture as well as interior decoration. Inside this restaurant, you will discover a harmonious combination of Eastern and Western style. A semi-circle, terrace glass door and windows that help people observe the spectacular scenery while having a dinner create a unique feature of the restaurant, making it outstanding from many other Halong Bay restaurants. The menu of this restaurant contains mainly Eastern and Vietnamese cuisine. 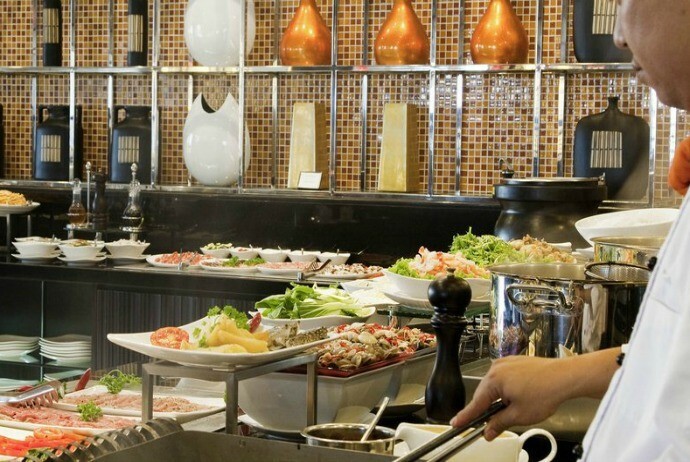 Additionally, Panorama serves European dishes which are suitable for those who love Western cuisine. Particularly, the food here is served in both carte menu and set menu, with freshly selected ingredients to help preserve the original food taste and meet the hygiene standards. Daily, this restaurant is opened for breakfast from 6 am to 9:30 am, for lunch from 11:30 am to 1:30 pm, and for dinner from 6 pm to 10 pm. Yet, if you would like to order the food from your hotel, this restaurant also provides delivery services during its opening hours. 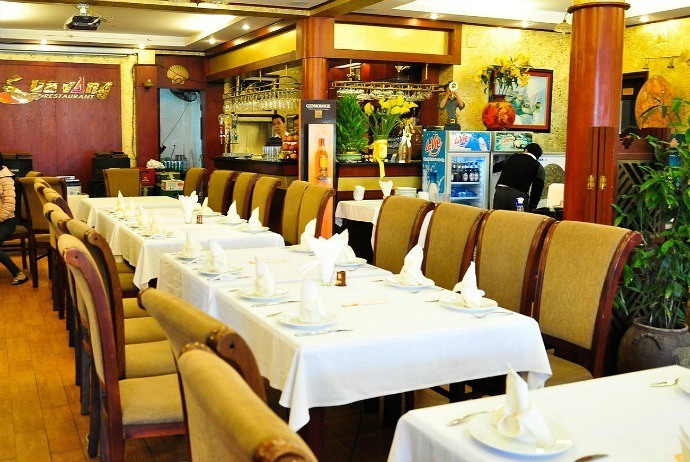 Mainly offering Asian Cuisine and seafood, Phuong Vi restaurant can accommodate about 70 seats. This restaurant has a unique menu in compared with other restaurants – its menu has a specific photo for its dish. Thus, guests will find it easy to choose among a wide range of options. Despite, the quality of food and the price are average; the staffs are really friendly and courteous. Also, this restaurant is clean. In order to get this restaurant, you just need to go along the Bai Chay (Bãi Cháy) Beach till you can reach Halong Road. It is situated on Halong Road and close to the Post Office. Are you a fan of luxurious seafood with especially good hygiene? Then, you should not skip Cua Vang restaurant – one of the best Halong Bay restaurants recommended for tourists. Known in English as Golden Crab, Cua Vang restaurant is a perfect place for guests to enjoy Vietnamese seafood in such a deluxe ambiance of Western style. When combined with blue, yellow, and pink neon lights, it creates a unique impression. This restaurant provides guests with various high quality seafood with good hygiene. All dishes here are cooked in clay pan in order to help keep its natural flavor. For those who still love to enjoy the taste of family dishes, there is a specific family recipe that has been passed down from different generations and amazed a lot of customers coming here. In addition to the extensive seafood menu, Cua Vang restaurant serves a wide selection of Eastern, Vietnamese, and Western cuisine. This restaurant is well-known for its great food and reasonable price. 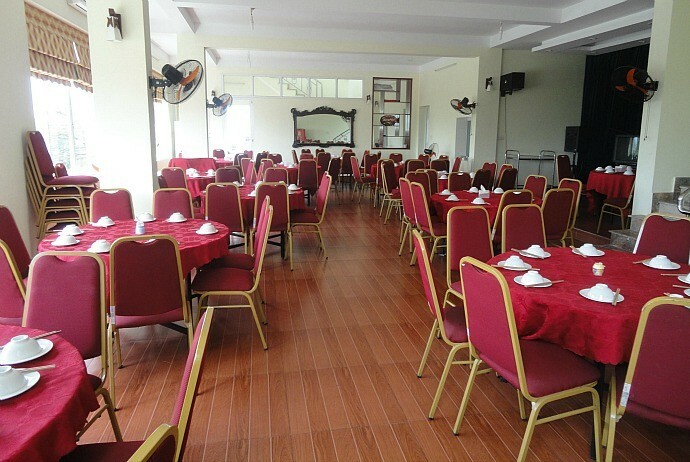 With modern and luxurious style, Linh Dan restaurant offers more than 200 seats with the convenient parking place. The popularity of this restaurant is guaranteed by their cook team, who could offer delicious and sumptuous meals with a diversified menu of Vietnamese, Asian, and Western cuisine. Besides, the staffs are very friendly and well-trained. 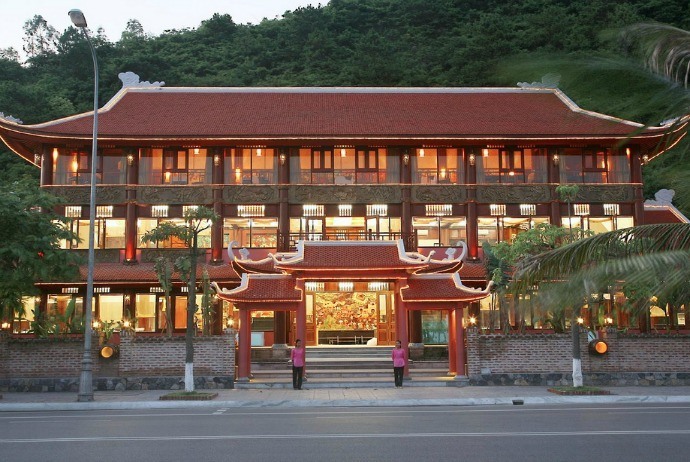 Co Ngu restaurant is opened in 2009, with an investment of over 2 million USD. The owner of Co Ngu restaurant is an innovative and ambitious person, who wants to construct the most luxurious restaurant in Halong. It is situated in the best location (in the center of the downtown, just a few minutes of walking from the deluxe hotels and Bai Chay beach). 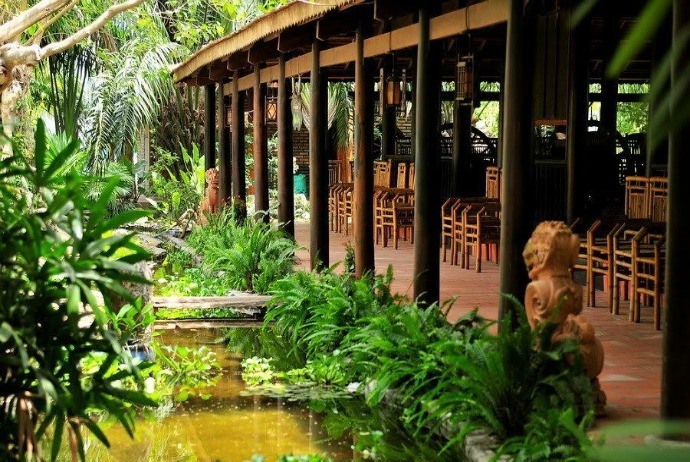 This restaurant is designed rather similar to a genteel Vietnamese palace in Hue, with impressive wooden style and amazing front garden. In reality, it is reckoned as one of the most unique, luxurious, and largest Halong Bay restaurants. Being designed in an ancient style, the restaurant has an image of the old royal palace. When entering Co Ngu, you will feel like entering into the past of the ancient Vietnam. Having 3 floors with different capacities in each floor, the restaurant can accommodate of nearly 600 guests at the same time. In detail, the first floor has a capacity of 250, the second – 180, and the third – 140. Also, there are 3 private rooms with particular amenities for those VIP customers. With an extensive and diverse menu offering a variety of dishes, Co Ngu restaurant can serve both Easter and Western cuisine. According to many former guests, Halong specialties are some of the most suggested dishes and cuisines in Co Ngu Restaurant, especially fresh seafood. Roasted oyster and shark fin are high class seafood served here. Besides, in this restaurant, guests could order a many kinds of wine, from traditional Vietnamese rice wine to famous Western wine brands. For those people who do not drink alcohol, they could opt for tropical juices which are readily available with the best quality. Love somewhere to dine out while still enjoying airy sea breeze? The following Halong Bay restaurants will not disappoint you! 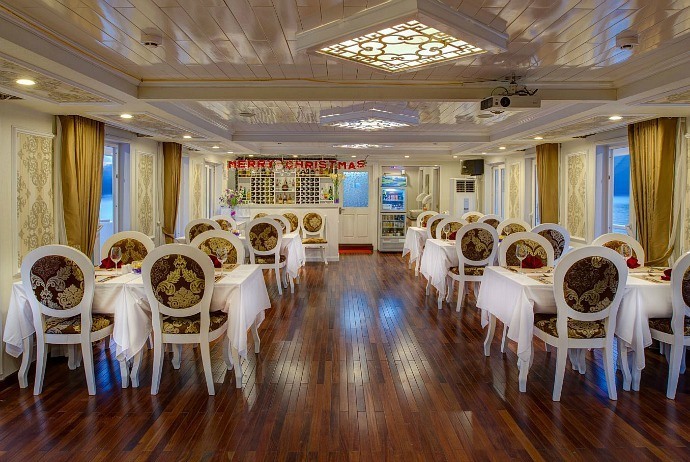 Also known in English in Dreamy Ocean, Bien Mo restaurant is a unique floating restaurant when it comes to famous Halong Bay restaurants. It just takes 15 minutes from land to get the marvelous restaurant. It rises and falls with the tide and is situated in a unique position in Halong Bay. 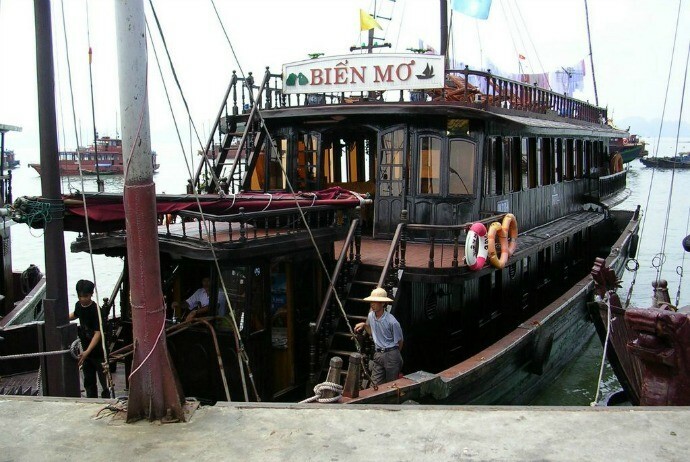 With a simple design reflecting a wooden floating house, from distance, Bien Mo floating restaurant looks similar to a fishing boat that could easily find in the bay. Actually, one of the charms of Bien Mo restaurant is its airy ambiance as well as strange location. Believe me, once you experience a dinning while being amid a bay of thousands of islands with subtle sea breeze, you will never forget it. That is also the reason why Bien Mo restaurant is attractive to tourists, not mention to its food quality. 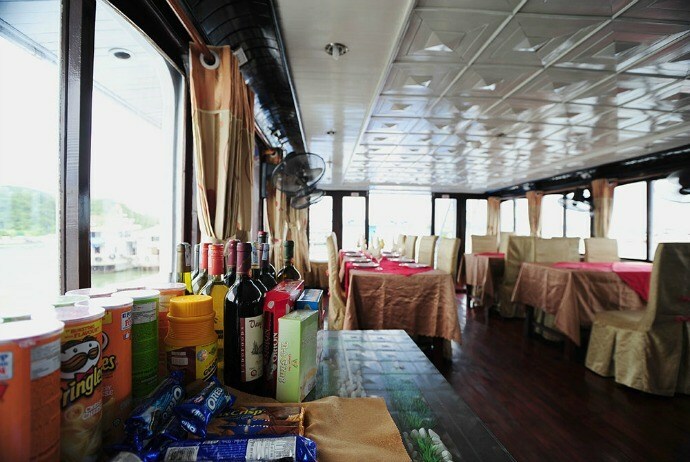 Another feature making Bien Mo floating restaurant one of worth-visiting Halong Bay restaurants is its delicious food. This restaurant itself fascinates the guests with fresh seafood. You could find almost types of seafood in Halong Bay here, from crab, cuttlefish, oyster, to snail and other kinds of fish. Furthermore, there are some underwater cages which help to keep fish alive all the time, so the quality and freshness of food is always qualified. The name of this restaurant is rather long but it is worth mentioning in this list of best Halong Bay restaurants. Standing from other poorly designed seafood restaurants in Halong City, Anh Duong Huong Lan has an exceptional exterior, in addition to a delicate, creative interior design. The harmony between red and white bricks and glass creates an impressive look for this restaurant from the outside. On the other hand, the architect of the restaurant also succeeded at splitting the inner space into distinctive regions with distinguished styles that could easily please any guest. Beyond that, there are many window seats for people who love viewing Halong Town’s authentic beauty. Not only is Anh Duong Huong Lan well-known for its magnificent design, but also offers a large number of freshly processed seafood. The dishes and specialties here are always prepared with professionalism and great care. Also, the restaurant itself is famous for its food hygiene and safety. Therefore, it is not necessary for you to worry about the quality of food when coming to this restaurant. Location: No. 39 Tran Hung Dao (Trần Hưng Đạo) Street, Halong (Hạ Long), Quang Ninh (Quảng Ninh) Province. Would you like to enjoy a royal treat? If yes, then Royal restaurant is your ideal choice. Overlooking the charming Halong Bay, this restaurant features with elegant style. There are colorful Vietnamese Lanterns hanging from the ceilings of the restaurant. Also, a live orchestra playing traditional Vietnamese instruments is always readily to serve the guests. Dinning at Royal Restaurant will surely bring to you a pleasant experience. There is a wide range of food in the menu, from average to good, but in general, none of them are bad. It is recommended to enjoy the piquant beef salad served with crushed peanut and lime, and shredded lettuce and tomato salad. The staffs here are attentive and friendly that will make any customer feel comfortable and enjoyable. This restaurant will bring you to a unique dining experience. Equipped with comfortable sofa chairs and large tables which are designed from dark wood and done up in floral fabrics, this restaurant has a harmonized setting that will comfort customers. As a guest, you will feel special and pampered when dining out here. The idea of having a dinner at a floating restaurant always inspires any tourist when visiting Halong Bay. Raft Floating Restaurant is among most famous floating restaurants in Halong. The cruise ship will take you to a floating fishing village, and you could purchase some additional seafood to enjoy for lunch or dinner. One of the top options of Halong Bay restaurants on Cat Ba Island is Green Mango, which offers you both good food and service. Guests could sit outdoors enjoying the harbor view or simply relax in a hip indoor and trendy setting. This restaurant has a great menu featuring fusion food along with tapas, mouth-watering main courses as well as delectable deserts. However, the prices might be a little bit above average. In the limited frame of this article, we may not cover all of the great Halong Bay restaurants that are recommended by a lot of former tourists worldwide. Yet, these 12 restaurants are the most out-standing ones we would like to recommend you to visit at least one time in your trip. In general, Halong City is no gourmet destination, yet this place is one of the best of Halong city’s options for fresh seafood. 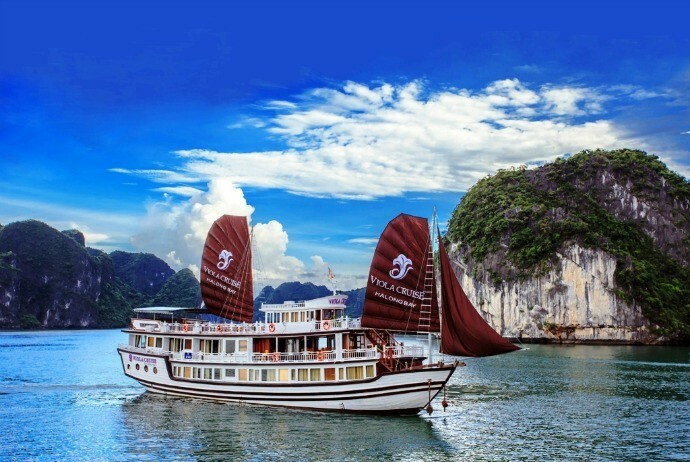 If you are going to visit Halong Bay in upcoming days, then list down some of the best Halong Bay restaurants mentioned above as your must-visit points and see how professional these restaurants are and how delicious the seafood served there is. Have fun in Halong, Vietnam!